Volatility Crush - What Does It Mean? What does the term "volatility crush" mean? 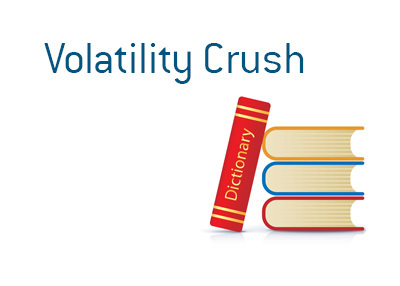 What is the definition of the term "volatility crush"? When it comes to the world of options trading, a "volatility crush" takes place when a significant drop in the implied volatility of a stock drastically reduces the price of an option. For instance - let's say that Apple is about to report their Q2 earnings. The options market is forecasting that the stock will likely move 6% in either direction after the report, so implied volatility is fairly high, which has resulted in some rich option premium. After Apple announces their earnings, volatility in the options drops like a stone, due to the fact that the major "event" (earnings, in this case) that the market was waiting on is now over. This means that the stock will likely not undergo any wild swings, at least for the time being. For instance - let's say that Apple is trading at $96 before its earnings. The July 100 call options, which expire in two weeks, are trading for $9.50. There are numerous factors used to calculate the value of an option, volatility being one of them. Apple reports its earnings and the stock rises to $101. Despite the underlying stock rising in value by $5 per share, the value of the July 100 call options fall to $7.00. This is due to a "volatility crush", as the implied volatility dropped substantially following the release of the earnings report.